That acclaim endures, and next week it will again be on the minds of racers everywhere as Clark’s winning car will participate in the prestigious Goodwood Festival of Speed on July 2-4. The Festival of Speed, held on the grounds of the Goodwood House in West Sussex, England, features historic racing vehicles in a hill climb on a 1.16-mile course. More than 100,000 people are expected to attend the event each day. The Ford-powered Lotus the Woods serviced back in 1965 has spent most of its life in The Henry Ford (museum), but now it has been put back in racing condition by Clive Chapman, son the of the car’s original owner Colin Chapman. It will be driven by an old friend of the Woods, Sir Jackie Stewart, a fitting choice given that both he and Clark are Scots. Among the honored guests will be two of the original Wood Brothers, Leonard and Delano. Delano hasn’t attended a NASCAR race since the last time he worked as jackman for the team’s famed No. 21, and that was back in 1983. Before the Lord steered him to church work instead of racing on Sundays, he set a record of 77 NASCAR superspeedway wins as a jackman, a mark that has yet to be bettered. Leonard Wood continues to be a familiar sight around race tracks as he works on the No. 21 Motorcraft/Quick Lane Ford Fusion. Many in the sport, young and old, still consider him the smartest man in the garage. The Ford folks weren’t kidding, and being as loyal to the Blue Oval as they were, Glen and Leonard were off to Indy. The first challenge was building a relationship with a group of racers they’d never met. “We rolled up to that shop and didn’t know if those people were going to accept us or not, being a foreign crew and all,” Leonard Wood said. “But they really welcomed us and seemed happy we were there and wanted to help us any way they could.” The Woods then set to work on the fueling system they’d use on race day. Engineers from Ford and the race team had developed a fuel tank that had a giant venturi inside. The principle was simple, and time-proven. It’s the same device that allows fuel and air to flow quickly through a carburetor and makes airplanes fly. The Woods knew it would work. Others were caught unaware, including one of the first inspectors to check out the team’s pit equipment. “The inspector said, ‘I’ll bet you a thousand dollars you can’t flow 20 gallons a minute through that thing,” Leonard Wood said. He declined the sure money, in the interest of keeping his secrets safe until race day. “All we were interested in was getting that thing through inspection and getting on with the program,” Wood said. To speed things up even more, Wood spent hours filing and fitting the connections of the fueling system, so hookups would be smooth and fast and there would be nothing impeding the rapid flow of fuel. He even climbed inside the fuel tank to do more grinding and polishing. The Woods also prepared for tire changes during the race, sanding and filing on the wheels and hubs and practicing tire swaps. But that tire work turned out to be unnecessary. Clark ran the entire 500 on the same set of tires, giving the Woods the distinction of winning both the Daytona 500 (in 1963 with Tiny Lund driving) and the Indianapolis 500 without ever changing tires and of giving Ford Motor Company its first victories in the two premier events. Still the pressure was on the Wood crew to perform on the biggest stage they’d ever seen – 350,000 to 400,000 people watching in person and millions more following the action on radio and TV. “I got a little bit nervous,” Delano Wood said. “But when that No. 82 turned off the track onto pit road, I went into 21 car mode. It took the nervousness out of me.” On the first stop, the Woods had Clark going again in a stunning 17 seconds. At that time a pit stop was expected to take a full minute or more. While the rest of the team concentrated on fueling, with Glen and others cradling the hoses so they wouldn’t sag and slow the flow, brother Ray Lee used a depth gauge to measure the tire wear. The second stop, at 24.9 seconds, was a little slower, largely because there was less fuel in the storage tank and therefore less gravity pressure. One person there that day who never doubted the Woods was NASCAR founder Bill France Sr., who had fallen out of favor with the Indy officials and wound up watching the race from the grandstands, as Ray Lee Wood recalled. 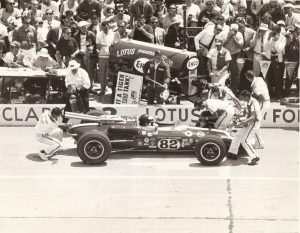 “When we made that first pit stop and broke all the records, the crowd roared,” Ray Lee Wood said. “They said France stood up and yelled ‘Them’s my boys.’” Once the Woods completed their second and final stop, Chapman, the team owner, showed everyone there just how grateful he was. “He jumped over the wall and congratulated us right there on pit road, hugging our necks and everything,” Leonard Wood said. For regular updates of the Woods’ participation in the Goodwood Festival of Speed, visit Wood Brothers Racing on Facebook.